Aims: To investigate blood pressure (BP) in children with sleep disordered breathing (SDB). Methods: BP was measured during single night polysomnography in 23 suspected SDB child patients with adenotonsillar hypertrophy, but without respiratory or heart failure, or coma. The age related changes of the observed BP were normalised to the BP index. The BP indices were examined in relation to SDB measures, such as the desaturation time (percentage of time with oxygen saturation (SaO2) <90% against the total sleep time), SaO2 nadir, apnoea-hypopnoea index (AHI), and arousal index, in addition to age and body mass index (BMI). Results: The systolic BP index during rapid eye movement sleep (REMS) tended to correlate with AHI, while the diastolic index during REM sleep showed a significant correlation with AHI. The BP indices during non-REMS and wakefulness showed no correlation with the parameters obtained. Patients with an AHI of 10 or more (n = 7, AHIhigh) had significantly higher systolic and diastolic BP indices during both wakefulness and REMS, compared with those with an AHI of less than 10 (n = 16, AHIlow). Two patients in AHIhigh showed no sleep related dip of diastolic BP, and three patients in AHIlow lacked the sleep related dip in systolic BP. By means of multiple regression analysis, age, BMI, and AHI were found to be significant predictor variables of the systolic BP index during REMS. Conclusions: BP in paediatric SDB patients is positively correlated with the degree of SDB. Sleep disordered breathing (SDB) is known to be associated with hypertension in adults.1–3 Although SDB occurs in about 1–3% of children,4,5 there are few studies on blood pressure (BP) in children with SDB,6–9 even though the first description of this association appeared in 1976.7 Marcus et al were first to systematically study BP in children with obstructive sleep apnoea syndrome,6 and found that child patients with obstructive sleep apnoea syndrome exhibited significantly higher diastolic BP during both wakefulness and sleep. In addition, they observed that all the subjects with increased BP values showed sleep related decreases in BP.6 In adult SDB patients, however, both systolic and diastolic BP are known to be increased,1,2 and some are known to lack the sleep related, nocturnal decrease, or “dip” in BP which is seen in normal subjects.10–13 Since no other systemic studies have been performed on BP in paediatric SDB patients,5 the exact nature of BP in paediatric SDB patients remains to be determined. This study aimed to investigate the nature of BP in children with SDB. Paediatric patients with suspected SDB underwent serial BP measurements during single night polysomnography. Informed consent was obtained from the guardians of each patient, and consent was also obtained from the child if older than 5 years of age. Patients were recruited sequentially from those referred to the Pediatric Clinic of Tokyo Medical and Dental University for evaluation of SDB. All children showed SDB secondary to adenotonsillar hypertrophy, but were free from cardiac, renal, or other diseases, and were taking no medication. A medical history was obtained and a physical examination performed by one of the investigators. Growth percentiles were obtained from standard growth charts. Children were considered obese if their weight was greater than 120% of the ideal weight for their height. The body mass index (BMI) was defined as the weight (kilograms) divided by the square of the height (metres). Five minute qualitative diagnostic calibration (QDC) was performed before each RIP recording. One episode of apnoea was defined as 10 seconds or more of respiratory suppression that did not exceed 25% of the baseline tidal volume determined during QDC.17 Hypopnoea was defined on RIP as a series of breaths that was less than 50% and greater than 25% of the baseline tidal volume determined during QDC.17 According to movements of the chest and abdominal portions during the respiratory suppression, a pause on RIP was taken as being obstructive or central.17 Following Marcus and colleagues,18 we did not count central apnoea following movement. Systolic and diastolic BP were measured every 15 minutes during polysomnography, using an automated system (Colin Listminismart BP-8800SF) and an appropriately sized arm cuff. We discontinued BP measurement if it disturbed the patient’s sleep. Mean systolic and diastolic BP were calculated for each patient over the course of the night. Data obtained during periods of wakefulness (including before sleep onset, during the night, and after sleep), REMS, and non-REMS, were analysed separately. Because BP in children changes with growth and development, we normalised the obtained BP values by means of a BP index. This consisted of the difference between the subject’s mean systolic and diastolic BP during the night and the cut off systolic and diastolic BP values that are considered to be hypertensive according to the subject’s age (table 1).20 These values are similar to the established normative data collected for Japanese children,21 although the cut off values were higher than the recently published values obtained for children in the USA.22 Thus, a BP index was calculated both for systolic and diastolic BP, respectively. Patients were considered to be hypertensive if a BP index was positive. The significance of correlation coefficients between BP indices and obtained parameters was assessed using the t test. Population characteristics on subdivision by means of AHI were compared using the unpaired t test and χ2 analysis. χ2 analysis was also used to compare the rate of patients who had no sleep related decrease of BP compared with wakefulness. BP indices in the two groups divided by the AHI were compared using the unpaired t test. Multiple linear regression was used to identify demographic, morphometric, and polysomnographic factors that might allow prediction of BP. A total of 32 children were studied. In nine subjects, BP readings interfered with their sleep, and thus the BP portion of the study was discontinued. We therefore analysed the results obtained for 23 patients (22 Japanese children and one Korean boy). A positive BP index was only obtained for the systolic index of one subject (ZS). The correlation coefficients between the six BP indices and age, BMI, DT, SaO2 nadir, AHI, and ArI were calculated. The systolic BP index during REMS tended to correlate with AHI (r = 0.413, p = 0.0502), and the diastolic BP index during REMS showed a significant correlation with AHI (r = 0.48, p = 0.02). No other parameters exhibited significant correlations with BP indices. In accordance with these results, we used AHI to subdivide our patients. Conventionally, we set the cut off AHI value at 10: there were 16 patients with an AHI of less than 10 (group AHIlow) and seven with an AHI of 10 or more (group AHIhigh) (table 2). Accordingly, AHI showed a significant difference between the two groups. However, no significant differences in age, BMI, percentage of obese subjects, total sleep time, or rate of REMS with respect to the total sleep time were found between the two groups. The total sleep time and the rate of REMS were within normal limits for our laboratory.23 In addition to AHI, DT, SaO2 nadir, and ArI showed significant differences between the two groups. The ArI values in AHIlow corresponded to the reported normal value in prepubertal children (7 ± 2/h).24 Table 3 shows the BP indices in AHIlow and AHIhigh. The patients in AHIhigh had significantly higher systolic and diastolic BP indices during both wakefulness and REMS, compared with those in AHIlow. However, the BP indices during non-REMS showed no significant differences between the two groups. Population characteristics and polysomnographic results on subdivision by AHI. Figure 1 shows the six average BP indices obtained for all 23 patients. In both AHIlow and AHIhigh groups, the average systolic and diastolic BP indices were highest in wakefulness and were lowest during non-REMS. In AHIlow, the mean diastolic BP index during wakefulness was significantly higher than that during REMS as well as during non-REMS (REMS, p = 0.04; non-REMS, p < 0.005). The average systolic BP index during wakefulness in AHIlow also exhibited a significantly higher value than that of non-REMS (p = 0.03). This value was also higher than that of REMS, although statistical significance was not obtained (p = 0.06). In AHIhigh, average systolic and diastolic BP indices during wakefulness showed higher values than those during REMS as well as those during non-REMS; however, these differences exhibited no statistically significant differences. No significant differences of BP indices were found between REMS and non-REMS in both AHIlow and AHIhigh groups. Systolic (A) and diastolic (B) blood pressure indices for all 23 patients during wakefulness, non-REMS, and REMS, respectively. Open triangles with dotted lines, AHIhigh (AHI, 10.0 or more); open circles with solid lines, AHIlow (AHI, 10.0 or less). W-BPS, systolic BP index in wakefulness; N-BPS, systolic BP index in non-REMS; R-BPS, systolic BP index in REMS; W-BPD, diastolic BP index in wakefulness; N-BPD, diastolic BP index in non-REMS; R-BPD, diastolic BP index in REMS. Two of seven patients in AHIhigh (29%), including ZS, showed no dip of diastolic BP indices during sleep compared with wakefulness, while three of 16 patients in AHIlow (19%) lacked the dip in systolic BP indices during sleep. These rates did not show a statistically significant difference. Both systolic and diastolic BP indices of the other 18 patients decreased during sleep compared with wakefulness. For multiple linear regression analysis, we selected one of the two related variables, SaO2 nadir and DT, that showed a high partial correlation coefficient. Because the correlation coefficient of DT with BP indices was lower than that of SaO2 nadir with BP indices, DT was eliminated from the analysis. Thus, we selected age, BMI, SaO2 nadir, AHI, and ArI as dependent predictor variables. SaO2 nadir and AHI were log transformed. We obtained significantly predictable regression formulae for all six BP indices. The significance of regression coefficients was obtained for age (p < 0.005), BMI (p < 0.001), and AHI (p < 0.02) with respect to systolic BP index during REMS, and for age (p < 0.05) with respect to diastolic BP index during REMS. For the other four BP indices, all regression coefficients showed no statistical significance. Children with hypertension related to SDB have been reported. However, most reports described children with severe SDB resulting in respiratory failure, heart failure, or coma.7–9 Marcus et al performed the first systematic study on BP in children with obstructive sleep apnoea syndrome.6 Their subjects as well as our patients were free from the above mentioned life threatening conditions. Marcus et al found that these paediatric SDB patients exhibited significantly higher diastolic BP, both during wakefulness and sleep.6 In our current physiological observation study, children in AHIhigh were found to exhibit higher diastolic as well as systolic BP indices during both wakefulness and REMS than those in AHIlow. Taking both results together, it could be concluded that BP in paediatric SDB patients without severe complications is positively correlated with the degree of SDB. Similar to Marcus and colleagues,6 we found no statistically significant differences of BP indices between REMS and non-REMS in both AHIlow and AHIhigh groups. Although Marcus et al observed that all subjects with increased BP values showed a sleep related decrease in BP,6 our only hypertensive patient (ZS) lacked the sleep related dip in diastolic BP. Moreover, the sleep related dip in BP did not occur in the other four patients (one in AHIhigh, and three in AHIlow). Verdecchia et al reported that in adult patients with essential hypertension, a blunted nocturnal dip in BP was associated with subsequent cardiovascular morbidity.11 Suzuki et al reported that 50% of the normotensive adult SDB subjects lacked a sleep related dip in BP (less than 10% decrease compared with wakefulness; non-dippers); 43% of the hypertensive patients were also non-dippers.12 Since we did not perform 24 hour measurement of BP, we could not identify non-dippers as well as dippers.10,11 However, we found the percentage of subjects who lacked sleep related decrease of BP to be 29% in AHIhigh and 19% in AHIlow, respectively. In addition, our only hypertensive patient (ZS) was found to lack this dip. According to Suzuki et al, in hypertensive non-dippers, respiratory disturbance index correlated well with average 24 hour systolic blood pressure.12 Corresponding to this observation, ZS had a positive systolic BP index during wakefulness, an AHI of 36.2, and an SaO2 nadir of 63%. Based on the result of simple correlation analysis, the degree of BP elevation during REMS was related to the AHI value, while that during non-REMS and wakefulness showed no correlation with the severity of SDB. Multiple regression analysis also showed that AHI was one of the significant determinants of the systolic BP index during REMS. BP during REMS might sensitively reflect the severity of SDB in children. Marked surges in arterial BP occur 7–10 seconds after each apnoea termination.1 In children, SDB is very much a REMS related disease.24,25 Indeed, all of our seven patients in AHIhigh and 13 of our 16 patients in AHIlow had a higher AHI during REMS than during non-REMS (data not shown). Thus, in child SDB patients, marked surges in arterial BP are likely to occur more frequently in REMS than in non-REMS. The current study revealed that a significant elevation of BP indices in AHIhigh, rather than in AHIlow, was obtained for REMS and wakefulness but was not observed for non-REMS. Although mechanisms remain unknown, surges in BP associated with sleep apnoea during REMS might be closely involved in the production of sustained elevation of BP during REMS and wakefulness. Although in adult SDB patients who had apnoea both in REMS and non-REMS, the mean BP of REMS was reported to be significantly higher than that of non-REMS, not only during apnoea periods, but also in ventilatory periods.13 Other factors than apnoea itself are likely to contribute to the elevation of BP during REMS. Arousal is one candidate that could cause an elevation of BP. However, at least in the current study, ArI showed no significant correlations with BP indices. Hypoxia is another candidate for increasing BP in SDB patients.26 However, according to our current multiple linear regression analysis, SaO2 nadir showed no contribution to BP. Measurements of both BP and oxygen saturation with a shorter interval might produce a different result. We also found that BMI was one of the predictors of the systolic BP index during REMS in East Asian children. Similar observations were made by Hoffstein27 and Coy and colleagues28 in adults, and by Marcus and colleagues6 in children, although these authors did not mention the races of their subjects. Recently, the role of obesity in SDB occurrence has been reported to be lower in Eastern people than in Western people.29 In seems necessary to pay attention to racial differences when studying at least the physical constitution of SDB patients. 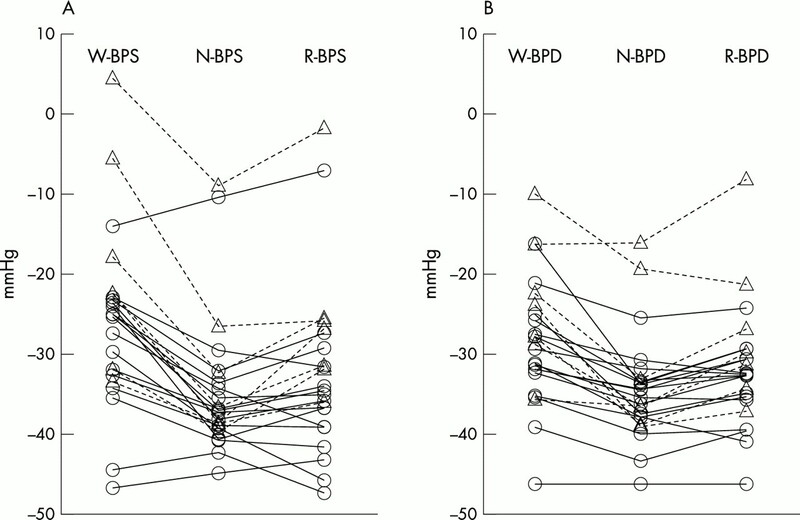 Weiss JW, Launois SH, Anand A. Cardiorespiratory changes in sleep-disordered breathing. In: Kryger MH, Roth T, Dement WC, eds. Principles and practice of sleep medicine. Philadelphia: WB Saunders, 2000:859–68. Bixler EO, Vgontzas AN, Lin H-M, et al. Association of hypertension and sleep-disordered breathing. Arch Intern Med2000;160:2289–95. Ohayon MM, Guilleminault C, Priest RG, et al. Is sleep-disordered breathing an independent risk factor for hypertension in the general population (13,057 subjects)? J Psychosom Res2000;48:593–601. Gislason T, Benediktsdóttir B. Snoring, apneic episodes, and nocturnal hypoxemia among children 6 months to 6 years old. Chest1995;107:963–6. Marcus CL, Greene MG, Carroll JL. Blood pressure in children with obstructive sleep apnea. Am J Respir Crit Care Med1998;157:1098–103. Guilleminault C, Eldridge FL, Simmons FB, et al. Sleep apnea in eight children. Pediatrics1976;58:23–31. Serratto M, Harris VJ, Carr I. Upper airways obstruction. Arch Dis Child1981;56:153–5. Ross RD, Daniels SR, Loggie JM, et al. Sleep apnea-associated hypertension an reversible left ventricular hypertrophy. J Pediatr1987;111:253–5. O’Brien E, Sheridan J, O’Malley K. Dippers and non-dippers. Lancet1988;ii:397. Verdecchia P, Schillaci G, Guerrieri M. Circadian blood pressure changes and left ventricular hypertrophy in essential hypertension. Circulation1990;81:528–36. Suzuki M, Guilleminault C, Otsuka K, et al. Blood pressure “dipping” and “non-dipping” in obstructive sleep apnea syndrome patients. Sleep1996;19:382–7. Tun Y, Okabe S, Hida W, et al. Nocturnal blood pressure during apnoeic and ventilatory periods in patients with obstructive sleep apnoea. Eur Respir J1999;14:1271–7. Kohyama J, Shiiki T, Shimohira M, et al. Asynchronous breathing during sleep. Arch Dis Child2001;84:174–7. Farré R, Monteserrat JM, Ballester E, et al. Importance of the pulse oximeter averaging time when measuring oxygen desaturation in sleep apnea. Sleep1998;21:386–90. Rechtschaffen A, Kales A. A manual of standardized terminology, techniques and scoring system for sleep stages of human subjects. Washington, DC: US Government Printing Office, 1968. Krieger BP. Respiratory inductive plethysmography. Probl Respir Care1989;2:156–75. Marcus CL, Omlin KJ, Basinki DJ, et al. Normal polygraphic values for children and adolescents. Am Rev Respir Dis1992;146:1235–9. The Atlas Task Force. EEG arousals: scoring rules and examples. Sleep1992;15:173–84. Scharer K. Hypertension in children and adolescents—1986. Pediatr Nephrol1987;1:50–8. Uchiyama M. Management of essential hypertension [in Japanese]. Shouninaika1990;20:1325–8. National High Blood Pressure Education Program, Working Group on Hypertenson Control in Children and Adolescents. Update on the 1987 task force report on high blood pressure in children and adolescents: a working group report from the National High Blood Pressure Education Program. Pediatrics1996;98:649–58. Kohyama J, Shimohira M, Iwakawa Y. Maturation of motility and motor inhibition in REM sleep. J Pediatr1997;130:117–22. Marcus CL. Sleep-disordered breathing in children. Am J Respir Crit Care Med2001;164:16–30. Kohyama J, Shiiki T, Ohinata SJ, et al. Polysomnographic findings on Far-East Asian child patients with sleep disordered breathing. Neurobiol Sleep Wakefulness Cycle2001;1:9–13. Imadojemu, VA, Gleeson K, Gray KS, et al. Obstructive apnea during sleep is associated with peripheral vasoconstriction. Am J Respir Crit Care Med2002;165:61–6. Hoffstein V. Blood pressure, snoring, obesity, and nocturnal hypoxeamia. Lancet1994;344:643–5. Coy TV, Dimsdale JE, Ancoli-Israel S, et al. The role of sleep-disordered breathing in essential hypertension. Chest1996;109:890–5. Li KK, Kushida C, Powell NB, et al. Obstructive sleep apnea syndrome: a comparison between Far-East Asian and white men. Laryngoscope2000;110:1689–93.